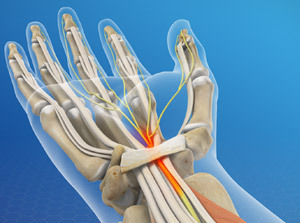 Open carpal tunnel surgery relieves pain caused by carpal tunnel syndrome – essentially a pinched nerve in the wrist. When non-surgical treatment options, such as such as bracing, anti-inflammatories, and corticosteroid injections, do not improve the symptoms of carpal tunnel syndrome, a carpal tunnel release may be performed to take the pressure off the nerve. There are two main techniques to accomplish this, open and endoscopic. Although Dr. Donnelly performs both, his preference is the open approach. He favors the open technique because it allows him to visualize the nerve, which decreases the risk of injury and confirms complete release. Carpal tunnel release is one of the most common hand surgeries performed. It has been rated as one of the most satisfying and successful as well. The surgery itself takes 10-15-minutes and is performed on an outpatient basis. Surgery can be done with the patient completely awake using a technique called wide-awake local anesthesia no tourniquet (WALANT), which involves just numbing the hand prior to the surgery. Traditional sedation anesthesia can also be used. How is open carpal tunnel surgery performed? The surgeon strategically makes a less than 1-inch incision over natural skin lines on the palm to minimize visible scarring after surgery. Surgical instruments are used to access and view the carpal tunnel ligament and the pinched nerve. The ligament is carefully cut releasing the pressure off the nerve. The incision is closed using sutures and a special suturing technique to limit wound complications. After the incision is closed, a soft dressing is placed over it and a bandage is wrapped around the wrist. In most cases, there is no need for a hard splint or cast after surgery. Patients return home shortly after surgery, with instruction to take it easy, ice and elevate the extremity. The dressing may be removed at home 4-5 days after surgery and the incision is allowed to get wet in the shower at that time. The sutures will be removed 1-2 weeks after surgery at the first post-op office visit.Although the discomfort for the incision is there, many patients experience symptom relief the day of or the first few days after surgery. In cases where severe symptoms present prior to surgery, symptom relief may take several weeks or months to resolve. Soreness around the incision may also persist for the same amount of time.Light activities are allowed once the dressings are removed. Most patients are return to normal activities one-month after surgery.